Looking back on what you have studied, discuss the following items. of all them in your conversations. things you can do there. 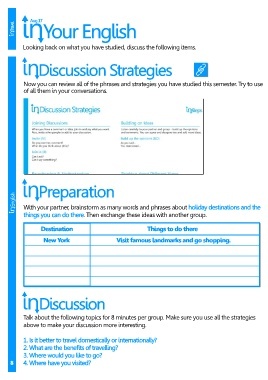 Then exchange these ideas with another group. New York                         Visit famous landmarks and go shopping. above to make your discussion more interesting. 1. Is it better to travel domestically or internationally? 2. What are the benefits of travelling? 3. Where would you like to go? 8    4. Where have you visited?